... was cancelled! However, I took Rowan, my 2-yr old grandson, to Toddington because he loves the trains, and there happened to be a race train this day. I don’t think he was greatly impressed by the loco being black instead of green! He was impressed with the yard shunting, though - buffering up and coupling, plus the diesel shunter then pootling off down the line on its own; and seeing a fork lift truck in action (they are usually sat idle when he sees them). It was a hive of activity - which was great for Rowan. Of course, there is always a danger that I will get sucked into something when I turn up “off duty”, and today was no exception: the railway had decided to move ex-our TPO, so they also needed the keys to our paint store … which are kept inside the van that we are using! 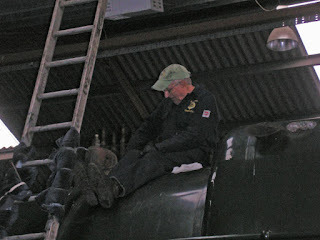 Today was the day to wash out the boiler. 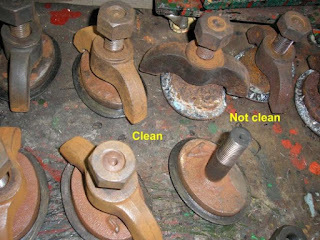 Brian and Gil removed the last two wash-out plugs from within the smokebox, while everything was got ready. 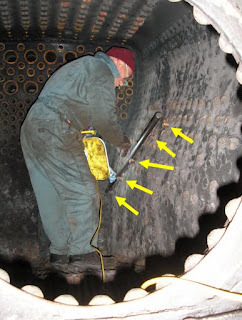 John G was in the container, cleaning the old gaskets off the mud hole doors and shining them up a little. That took care of our remaining two wire brushes! Gil set up the electric version outside, and began cleaning the threads on the wash out plugs. After lunch the action began for real! Brian was persuaded to clamber onto the loco and insert the hose into each orifice in turn. John G manned the pump and Bruce controlled the tap. I was inside the container, when there was a sudden downpour! The chaps made a run for it; Brian (who was by now at the chimney end) yelled for someone to hold the ladder (but no one could hear because of the rain!!! ); Gil, who was still wire-brushing outside, dived under the platform that used to lead up to the TPO (but now leads nowhere). Well, if they weren’t wet from the washing out, they were certainly wet now! After the storm and the washing out, Carpo, Brian and John formed a chain passing fire bars up and into the firebox. The grate is now in place. 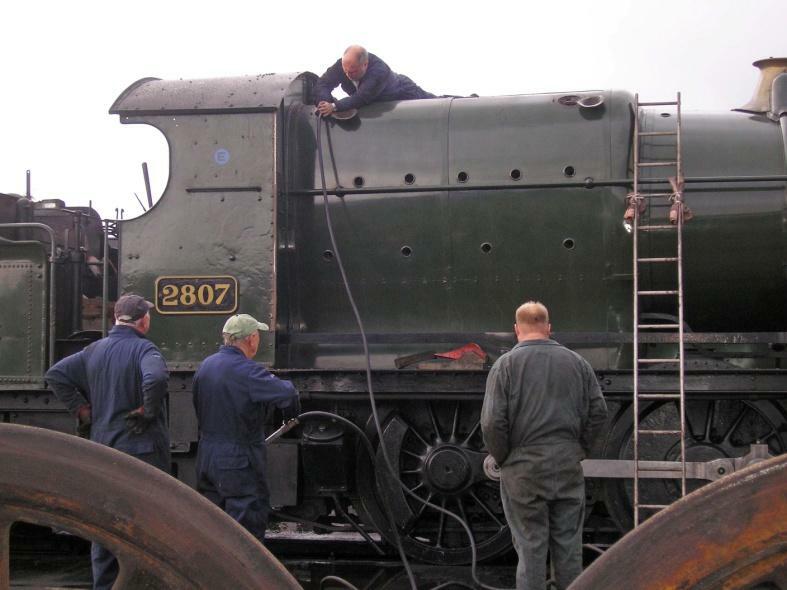 Four of the (cleaned) mud hole doors had been refitted, and the other four had gaskets fitted in readiness. Still firing on all two cylinders, the intrepid trio proceeded to gather up the superheater tubes and feed these into the smokebox and down their flues. There was no time to fit them, but at least they are in the right place. Bruce cleaned up the components of the gauge frame ready for that to be refitted on Saturday. The current (!) plan is to complete everything on Saturday and light a warming fire, followed by an informal steam test on Sunday or Monday. The brick arch is not yet in place, but two bars have been delivered. 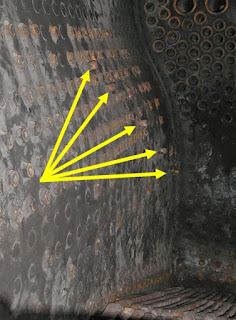 These run along each side of the firebox, sitting on five studs, and form a foundation for the bricks of the arch. They need bending to fit the contour of the firebox sides. The fusible plugs have not been changed, either, so there are still a few things to do. The formal steam test is scheduled for 28th, I believe. Here you can see the contour of the firebox side, and how the five studs are spread across the curve. And here is David test fitting a bar and working out where to apply a bend. Gilbert is in there, too, but is hiding behind David! By end of play, both bars had been cut to length and bent to fit the sides. They are ready to take the brick arch, but this will not be fitted until after a steam test. It was a tad cool outside (actually, it was even cooler inside the loco shed! ), but John T insisted on cleaning up more rail chairs for us. In doing so, he stumbled upon one with his very own birth date upon it! So, that one is now reserved. 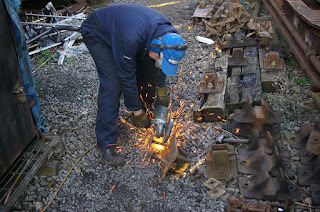 Meanwhile, a lady from north of the border has ordered an LMS boot scraper, so John tackled that to start with. I have discovered that boot scrapers are just inside the weight limit accepted by UK Mail, so we can now despatch them country-wide. Last week I sent one to Kent. In fact, at 09.30 this morning I was handing over a 1946 special order to a couple from Swindon - it’s her father’s year of birth, of course. Back to Gil & David: they are working on making a gadget to enable the timing of the cylinder valves to be adjusted. It’s nice to get a near-perfect beat. 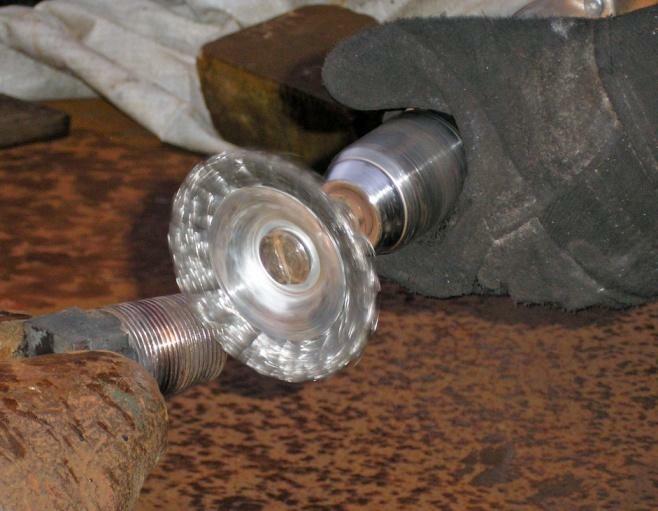 Ours was alright until we inserted fitted bolts into the RHS rock shaft. This stopped it from rocking in the wrong direction, but until then its unintended movement was compensated by the valve setting, resulting in a regular beat … Now it doesn’t budge, we’ve got to adjust the valve! I pressed on with the leading edges of the cab, which had been filled last week. I sanded this down and applied a primer coat. I don’t expect the top coat to quite match the 10-yr old paint on the rest of the cab, but I’ll do my best.